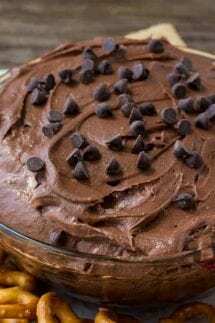 Brownie batter dip is the most decadent, delicious, easy way to eat brownies. It's extra smooth and creamy, super chocolate-y and the perfect treat for parties and get-togethers. In a large bowl beat together the cream cheese and butter until soft. Beat in the brownie mix (if it's lumpy you may need to sift it first). Then beat in the milk 1 tablespoon at a time until it's smooth and creamy. **Store in an airtight container in the fridge.